Todays brides and grooms are looking for ways to include man’s best friend in their wedding ceremony. If this is something you would love to do but do not have a pet friendly reception cite then check this out. I was searching the archives of Style me Pretty, when I found this super cute wedding decoration. 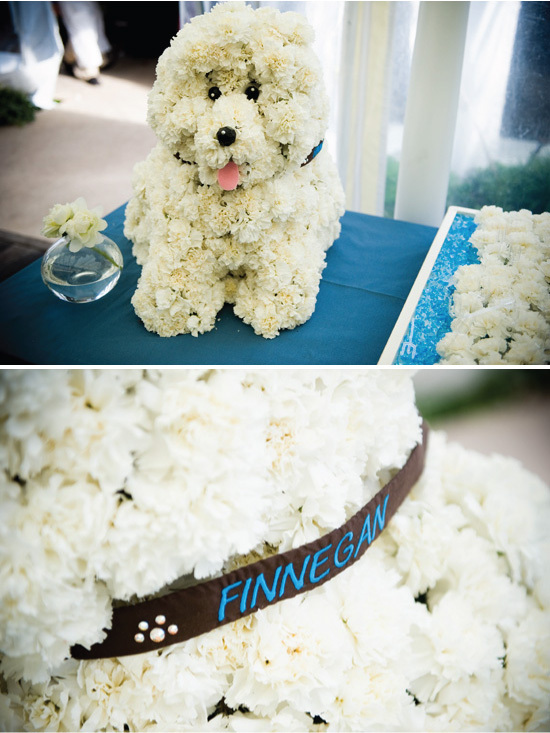 Apparently Soiree Floral in Nantucket, designed this little doggy special for a bride to surprise her groom. This is a floral arrangement meant to resemble the couples dog, since the pampered pooch could not attend. 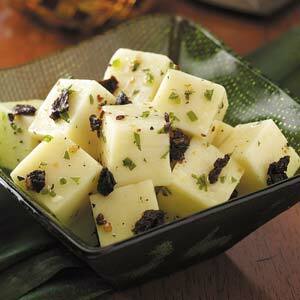 In a large resealable plastic bag, combine the first seven ingredients; add cheese cubes. Seal bag and turn to coat; refrigerate for at least 30 minutes. Transfer to a serving dish; serve with toothpicks. Yield: 8-10 servings. 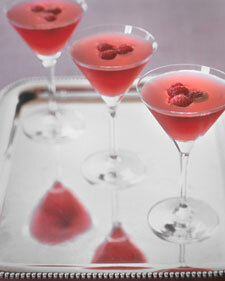 If one of your wedding colors is red or you just love raspberries then this is one drink you have to have! This fruity cocktail combines raspberry with the traditional flavors of a cosmopolitan to create a wonderful array of flavors. 1. Fill a cocktail shaker halfway with ice. Add vodkas, Chambord, lime juice, simple syrup, and cranberry juice. Shake or stir until well chilled. Strain into a martini glass. Garnish with raspberries; serve. Here is a great video to look at to get inspiration for you wedding day hair. There are some classic and timeless styles that are simply lovely. Enjoy! Few people enjoy sitting in a drab cubicle for 8 hours a day, year after year. With telecommuting options becoming more popular in the workplace, many Americans have become accustomed to the perks of working from home. Thankfully, the developments in Web 2.0 have made online jobs and business opportunities plentiful. Kiss your cubicle goodbye and learn how you can make your living from the comfort of your living room. Certain jobs lend themselves to the online marketplace and others do not. So the first hurdle you have to clear in determining whether moving online is right for you is to figure out whether or not the web is suitable for your field. The good news is that even if your business has a physical inventory, the web is still an extremely profitable place. Just look at Amazon. Below are some tried and true ideas for an online business start-up. eBay : Practically anyone can become a seller on eBay and make lots of money doing it. Create an account, fill up your store, and get started. It just takes a simple Google search to find documented examples of how so many people have made this business model work for them. Become a Blogger: Today it seems that one of the most hip and popular ways to become a self-sufficient, home-based employee is to put your writing talents out there and become a paid blogger. You can do this by writing for an already-established blog or setting one up yourself. If you have a niche expertise, consider the latter; if not, look into websites like Pay Per Post that encompass a variety of topics. Be a Reviewer: Believe it or not, you can make decent cash just by spouting your opinion on different products and services. Through sites like Review Me, bloggers are paid well to review advertised offers and products. Go Custom: Do you have an ability to customize basic products? Often times all it takes is a modest inventory of items like plain T-shirts, coffee mugs, and baseball caps and the tools to inscribe personalized messages on them to turn a profit. This may require more of an overhead investment, but being in a specialized market will allow you to increase sales. Amazon : The Amazon Affiliate Program lets you to set up your own online Amazon affiliate business through which you help drive customers to Amazon’s website and make a commission on the purchases. Web Design : If you have technical prowess and an eye for aesthetic design, then one of the more fruitful online businesses you could start is a web design boutique. Today people require websites for pretty much everything, whether it’s their own business or simply their resume. Web developers get paid well and need nothing more than their computer and creative mind to rake in the cash. Etsy: Budding fashion designers and jewelry artists can sell their goods and get lots of promotion by setting up online stores on Etsy. Etsy is that it’s a heavily trafficked site, and designers can use their Etsy store front to link customers back to their personal websites and a larger selection of goods. Event Planning: If an attention to detail and an ability to party are your strong suits you might consider starting your own event planning business. This requires little overhead aside from a computer and it’s a service that many businesses, nonprofits, and individuals need. Assemble an online portfolio of past events and services and start developing client contacts. Sell eBooks: eBooks are downloadable books available online, and there is a big industry around the buying and selling of these digital files. Sellers can access titles for a wholesale fee and then mark them up to sell to customers. Be an Author: If starting a blog is not exactly your cup of tea, or if you feel your expertise lends itself to a longer format, then become the author of your own eBook or series of eBooks. This course of action can be particularly profitable when linked with a blog that gives readers a taste and leaves them wanting more. Marketing Consultant: Many small businesses and other self-employed persons do not have the budget to afford an in-house marketing team, but still must market themselves if they want to stay relevant. That’s where you come in with a home-based consultancy business that promotes the businesses of your clients. Accounting: If working with numbers is your passion, an accounting consultancy business is easy to start online. Aside from the relevant software needed to manage multiple accounts, there is little overhead. Social Media Consultant : Social media is primarily found online and most of it is new and overwhelming to traditional “take an ad out in the paper” business leaders. If you live on Facebook and other social media sites, promoting yourself as an expert in maximizing the benefits of this arena for un-savvy business owners can be quite lucrative. Direct Mail Copywriter: Many nonprofits make a large portion of their revenue through direct mail campaigns. But with all the competition in the marketplace and the consumer backlash against junk mail, organizations really need to stand out in order to command attention and donations. If you know the tricks of this trade, you will find lots of consultant positions in the marketplace. Stylist: While stylists may not be considered necessary in the current economic crisis, their rise in popularity in recent years has undeniably been dramatic. And personal stylists and shoppers aren’t just for people like Britney Spears, women of even modest incomes have been known to pay for a little fashion advice. If you’re a trendsetter in your city, market your talents to the upper crust crowd. Garden Consultant: If you have a green thumb and the garden to prove it, consider becoming a garden consultant. Most people don’t have the time or patience to plant a garden, but will pay big bucks to have someone do it for them. IT: One of the best paid and most established consulting jobs can be found in the field of information technology. By setting yourself up as a roaming computer whiz you can solicit business from technophobes in your community and beyond. Grant Writer: Aside from individual donors, nonprofits and some government agencies get the bulk of their funding from larger corporate grants. If you are skilled at grant writing and have a decent number of nonprofit contacts this is a business easily conducted online. Publicist or PR Representative: Stars and athletes aren’t the only people in our society who need representation. In fact, many businesses want nothing more than to be covered favorably in newspapers and trade journals. Editorial Consultant: If it irks you every time a writer misplaces a semicolon, then your obsessive eye for grammar could help you bring in quite a bit of dough. Editorial consultants are used by both major magazines and independent writers alike to help them perfect their prose and polish their product. Lobbyist: Anyone with a strong expertise in a field affected by government is a good candidate to become a freelance lobbyist. You donÆt have to live in Washington D.C. to make your knowledge work for the good of your community. Business Advice: Do you have a strong track record of starting or managing successful businesses? If so, your know-how is in strong demand by the thousands of individuals who have great, profitable ideas but no idea how to put them in to action. Doggie Daycare: Animal lovers with some extra space at their homes might want to consider starting their very own doggie day care center. Set up a website detailing your facility and the services you offer and take it one step further by incorporating an online advice column for people who have questions about their pooches. Travel Agent: Becoming a home-based travel agent is pretty easy these days, provided that you have some background in the industry. Sell yourself as a travel expert by including interesting travel facts, articles, forums and a blog on your website. Teaching Green? : Environmental concerns reign in today’s business climate, not only because businesses and other institutions are concerned about being more responsible, but because they’re looking to cut energy costs. Use your green knowledge to help people achieve both of these goals. Now that you’ve determined what business to go into, you’re going to need to find some customers! In the days of Web 2.0 that is best achieved by getting online and networking with consumers and with your business peers. Here are just some of the social networking sites on which all online business owners should have a presence. LinkedIn: If you haven’t heard of LinkedIn yet, you’ll want to get an account pronto. Designed to be a business and social networking site, LinkedIn connects you to others, sharing your personal and professional information, including your resume (if you choose). Facebook: Not to belabor the issue, but Facebook is the ?it? social networking website right now, and its not just for college students anymore. Most businesses these days have a Facebook profile and are reaping the rewards from the mass communicative capabilities it brings. Ning: While you should certainly be out networking on other people’s social networking sites, there’s no reason you can’t form one on your own site. Ning, a cheap and comprehensive service, allows you to create your own social networking site relevant to your businesses niche. The best way to inspire loyalty among your customers is by letting them feel like they are a part of your community. Care 2: Despite the name, this social networking site isn’t just for charities or big philanthropists. It’s for any person who is interested in making the world a better place. Does your business help improve the lives of others? Does it have a social mission? If so, Care 2 is a place where you’ll meet like-minded people who want the best for the planet. Plaxo: Plaxo is like an online rolodex, allowing you to organize your contacts and also communicate with them online. It’s the easiest way to keep tabs on all the movers and shakers in your industry. Ryze: Ryze prides itself as being “the site” for business networking. Set up explicitly to accommodate businesses, Ryze even allows user members to make deals through their platform. Sign up and connect with new and old contacts in seconds. Xing: Xing’s tagline is “Global networking for businesses,” and it means it. Xing will give you a crash course in networking and put you in contact with the “who’s who” crowd in your industry. Looking for investors or employees? Find them both on Xing. All Freelance: While not primarily a social networking site, All Freelance is the perfect site for small business owners or start-up online businesses to find employees that you can hire on contract basis. Post jobs, find employees, and get lots of information on self-promotion. Net Party: Like the idea of social networking, but want some face-to-face contact as well? Register with Net Party and get all the latest updates on business networking happy hour and party events in your city. The best way to establish a true connection with someone is to meet them in a casual setting. Squidoo: Squidoo bills itself as the forum for experts. By creating your profile page and posting entries on the things you know best, you’ll be able to spread your ideas, meet like-minded (or not) people, and connect with people who can help your business benefit the most. Digg: Digg is a social news site that lets you stay abreast of the most-read articles relating to your industry, as well as connect with others. Register for an account, start researching, and stay on top of trends. Reddit: Similar to Digg, Reddit is a social news site that lets readers vote on the value of content, giving you a sense of what people are most interested in relating to your industry. Delicious: A social bookmarking site that lets you store online articles in one place. You can also share your library of content with others in your network. Technorati : One of the best ways to drive traffic to your business website is to write a blog. Keep your blog fresh with relevant content and register it with Technorati, a round up of global blog posts, and increase the size of your audience. You Tube: Promote your business with videos and use You Tube’s wildly-popular platform to get it out to the people. In addition to blogs, video is generally seen as one of the most important marketing tools a business can use to set itself apart from the competition. Ecademy: Ecademy’s tagline is simple: “Connecting business people.” It boasts over a million users annually, bringing users from over 180 countries together to blog and compare ideas through focused forums. Mixx : Like Digg and Reddit, Mixx is a content round-up site that lets users rate content with even more customization. It’s a hip new platform that’s taking off in a big way. 43 Things: Want to be sure that you’ll reach those lofty goals you’re setting for your business and yourself? 43 Things is a social networking site where users set goals and then get advice and encouragement on meeting them from others in their network. Schmoozii : Perhaps the most important thing you can do for your business is promote it. Schmoozii is a social networking site aimed at marketers and start-ups where the ideas flow like wine. Wikipedia: Wikipedia is one of the most-used sites on the Internet, and no matter how many criticize it for it’s citizen-written content, establishing a presence on this site is a solid move for any business. Tell people who you really are in your own words. Flickr: Depending on what your business does, Flickr may or may not be extremely helpful. But this photo sharing site does let you connect with others in a more creative and visual way. While online networking and social media sites will be integral to the success of your business, good old-fashioned advertising is still a necessity and a useful tactic. Here are a few options and information resources that will help you take your ad campaigns to the masses. AdWords: Google’s AdWords is a great program if you want to promote your business and stay within a budget. Create online ads that will pop up when ever a user searches for terms that are related to your business. You pay only when people actually click on your ads, and you can cap the amount you spend monthly. Internet Advertising: If you are wary of the benefits of advertising online, check out this thorough and helpful article from The Economist that spells out how you can best take advantage of this new market to grow your business. Pop-Up Ads: One way to advertise online is by using pop-up ads, which actually pop up over web pages, forcing the user to close them out if they’re not interested in the content. While not well-loved by Internet surfers, their method of obstruction can be very effective in getting the message out. Marketing Sherpa: When determining an advertising plan, one resource you’ll want to check out is Marketing Sherpa. Sign up for their free newsletters and read through their scores of case studies to see what has and has not worked for others in your field. Stromcode: The founder of Glowfoto, a social networking and photo hosting site, gives sage advice on this blog based on his own experience building an Internet business from the ground up with advertising. Value Click: Value Click is one of the largest companies in the world to specialize in Internet marketing and advertising for businesses, so if you are really looking to do a comprehensive campaign it would be worth it to see if they fit in your budget. Customizable campaigns are the name of the game with Value Click and you’ll be sure that your ads are being placed prominently. Casale: Like Value Click, Casale offers online marketing programs for business leaders. They claim to have a vast reach in the U.S., Canada, and the UK, with a U.S. audience estimated at 129 million people. AdBrite: Buy customized text ads through AdBrite, which boasts an estimated 378 million ads per day on more than 70,000 different websites. Consider AdBrite the middle man who will get your ad on some of the most heavily-used sites. Double Click: Double Click is one of the most-used, most-popular internet advertising boutiques. It’s streamlined method does all the work for you and allows you to easily stay on top of all the campaigns you’re running. MySpace: Getting your ads out on social networking sites like MySpace and Facebook is a great way to promote you business, since each site boasts so many users. IAB: The Interactive Advertising Bureau is a good resource for a business owner looking for help with internet advertising. The trade organization for companies in the interactive advertising industry, it’s a good starting place for research since IAB members place over 86 percent of all online ads. O’Reilly Radar: Online advertising is an important to marketing your business, but there’s a lot to learn about the economics behind it. Take a look at this article posted by Tim O’Reilly for a better understanding of how it all works. Clicksor: Clicksor operates in a mode similar to AdWords, by tying your ads to relevant keywords, and claims it’s the most cost-effective online advertiser û it charges you on the relevance of your keyword. Web 2.0 Advertising: Jason Calacanis is the successful co-founder of Weblogs, Inc. and Mahalo.com, and according to this post on his blog, the future of online advertising is going to continue to grow, particularly in the arena of video ads. Banner Report: Thankfully, one obsessive guy had the foresight to spend thousands of hours collecting banner ads from tons of websites and storing them in a single repository for business owners and graphic designers to view. Review the examples, get some insight into your own banner-ad campaign, and joining the discussion boards. eMarketer: eMarketer is a great resource for any start-up company, because it’s laden with handy information. Check out the numerous analyst reports on different market conditions and get a daily email newsletter with useful tips. PromoTXT : Internet advertising, at the ripe age of 13, is, sadly, no longer considered cutting edge. While still very effective, some analysts say that text messaging ads is the wave of the future. Check into companies like PromoTXT to see if this tactic will work for you. Cell It: Like PromoTXT, CellIt will help you connect to customers via cell phone, whether that be by advertising promotions or simply alerting them to your latest blog post. Cellit has helped companies like Remax, Sotheby’s, and the City of Las Vegas increase their reach through texting. Message Buzz: Message Buzz is a hip company that works independently with customers to find their niche market and draw those customers in. Become a savvy marketer by targeting select consumer groups with different campaigns. Blast Companies : Another mass-texting marketing company with the capability to personalize texts. PR Web : Public Relations is the cheapest, and some argue the most credible, form of free advertising. Get your press releases out to millions of customers through PR Web’s services. Now that you’re on the road to being a business owner, you’ll need to start acting like one. Here are some general resources you can utilize to make sure you have your chips in order. Entrepreneur.com : A terrific resource for budding entrepreneurs, this website covers everything from profit potential to business loans with lots of great advice in between. Even connect with other entrepreneurs and ask the site’s experts questions. Business Week : This site is consistently updated with the most important information and news stories relevant to business owners. Online Business Advisor : Access tons of free articles on this popular website and get thorough advice from several experts û a great one-stop-shop for budding entrepreneurs. CNN Money : To be on top of your game, you’ll have to stay on top of the market. Check in with CNN Money throughout the day for the latest financial news. Inc.: A hip and popular magazine, Inc. keeps up with the most cutting edge trends in the business world, catering solely to entrepreneurs. Fast Company: The magazine covers everything an entrepreneur needs to know, and the website goes even further by serving as a catch-all for business-related blog posts, videos, and forums. Pro Blogging Advice: If you have chosen to go the blogging route for your business, you’ll want to check this resourceful guide with tips and pointers on how to make your blog profitable. Amazon Affiliate Advice : A great article that will help you significantly simplify the process of becoming an Amazon affiliate. Easy to follow instructions on how to set up your site and start making money. Small Business Network: The producers of this magazine target managers of fast-growing businesses with lots of advice and insight from industry experts and seasoned columnists. Entrpreneur’s Journey: Get advice straight from the source. This Australian blogger tells you how to finally get the online business of your dreams up and off the ground. Home Business IT : If you are still searching for the perfect business idea that will make you money from home, peruse on this company’s website, which lists several ideas and businesses looking for a few good men. Steps to Starting an Online Business : A helpful blog run by a woman who has had success with her own Internet business. Approved Authors : A helpful article on ApprovedAuthors.com about starting a successful online business. BPlans.com: Need help getting your business plan down on paper? Get inspiration from the sample plans on this site, many of which are free to view. BusinessPlans.org : A resource with sample business plans from real businesses. Planware: Planware’s software will help you write a business plan, create financial projections, and craft a marketing plan. Money Hunt : Download this easy-to-use template and plug in your information. Scribd : Another easily downloaded Word Document plan û all you need to do is fill in the blanks. Free Advice : Do the legal and bookkeeping issues associated with owning a small business have you confused? Check out Free Advice’s site for all the information you need on the legal implications involved in being a business owner. Nolo: Nolo provides cheap legal advice for small businesses and a directory of U.S. lawyers, as well. Law Info: Find both an attorney and free legal advice on Law Info. Find Law: Another terrific legal resource, Find Law will help you locate not only lawyers and free advice, but the actual text of the laws that will affect you most. Business Finance: Search for loans from over 4,000 lenders and learn what each loan entails. Business.com : A round-up of small business loan resources from Business.com. eHealthInsurance.com : Compare health insurance plans for small businesses on this easy-to-use site. HealthInsurance.org : A nonprofit resource where you can get the skinny on finding affordable insurance. Small Business Insurance : Find out what you need to do to protect your assets by reading this great article. The Small Business Insurance Center : Find a variety of insurance quotes from this center. My Own Business: My Own Business is a nonprofit that helps prospective entrepreneurs form a rock solid plan through a 14-session crash course. While you’ll have to pay for the education, this is something true novices may want to look into. Small Business Administration: The U.S. Small Business Administration is your best source to learn about government programs and tax implications of owning your own small business. Volusion : If your business will include an online storefront, turn to a company like Volusion for an easy set up and professional finish. Circle Dog : Seven smart tips for small business owners from Circle Dog, software developers that specialize in solutions for people like you. Are these not the most gorgeous ring pillows you have every seen? I have already bought the ring pillow for my wedding, but I am half tempted to put it to the side and buy one of these. These ring pillows are from the brilliant designer Anna Whitford. Each pillow is hand made and sculpted on complementing silk dupion. I love the soft detailing and the beautiful flower shapes that are complimented by the satin ribbons in the center to tie the wedding rings. I also love how the ones with color have them subtly incorporated into the design. The best part is that you are able to pick and choose the color and style flower to suit your wedding theme! 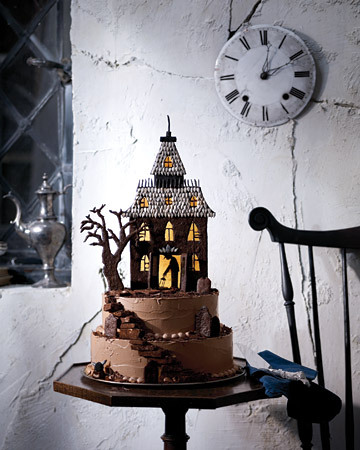 Here is a cute DIY idea from Martha Stewart.com. 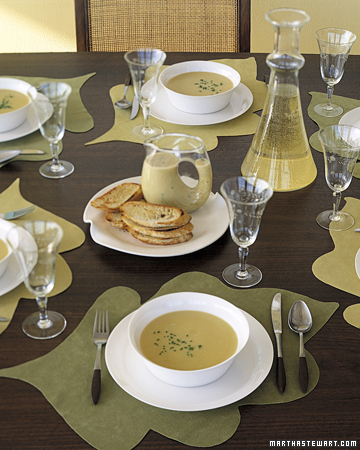 These ultrasuede place-mats are great for a small intimate wedding, a fall themed wedding shower, or bridal luncheon. I love the modern feel they give to the table. I also think these would work well for my Thanksgiving dinner place settings this year! If you like this design as much as me, then click the link below to get the template and instructions!